To Cite: Azin M, Zangiabadi N, Iranmanesh F, Baneshi M R, Banihashem S. Effects of Intermittent Theta Burst Stimulation on Manual Dexterity and Motor Imagery in Patients with Multiple Sclerosis: A Quasi-Experimental Controlled Study, Iran Red Crescent Med J. 2016 ; 18(10):e27056. doi: 10.5812/ircmj.27056. Background: Intermittent theta burst stimulation (iTBS) is a repetitive transcranial magnetic stimulation (rTMS) protocol that influences cortical excitability and motor function recovery. Objectives: This study aimed to investigate the effects of iTBS on manual dexterity and hand motor imagery in multiple sclerosis (MS) patients. Methods: Thirty-six MS patients were non-randomly assigned into sham (control) or iTBS groups. Then, iTBS was delivered to the primary motor cortex for ten days over two consecutive weeks. The patients’ manual dexterity was assessed using the nine-hole peg test (9HPT) and the Box and Block Test (BBT), while the hand motor imagery was assessed with the hand mental rotation task (HMRT). Results: iTBS group showed a reduction in the time required to complete the 9HPT (mean difference = -3.05, P = 0.002), and an increase in the number of blocks transferred in one minute in the BBT (mean difference = 8.9, P = 0.001) when compared to the control group. Furthermore, there was no significant difference between the two groups in terms of the reaction time (P = 0.761) and response accuracy rate (P = 0.482) in the HMRT. Conclusions: When iTBS was applied over the primary motor cortex, it significantly improved manual dexterity, but had no significant effect on the hand motor imagery ability in MS patients. The primary motor cortex (PMC) not only plays a role in movement but also in motor imagery (MI), which has neural mechanisms similar to the preparation and programming of actual movements (1). MI is defined as imagined movement without overt action that induces sub-threshold activation of the motor system, and can reflect motor cortex activity (2). Repetitive transcranial magnetic stimulation (rTMS) is a non-invasive cortical stimulation technique that modulates cortical excitability and plasticity at the site of stimulation, as well as at the remote sites of stimulation (3). Intermittent theta burst stimulation (iTBS) is a novel protocol of rTMS which has long-lasting and powerful excitability effects on the human motor cortex (4). In chronic stroke patients, iTBS has enhanced corticomotor excitability and functional recovery in paretic limbs (5), and has also increased motor cortical excitability in patients with Parkinson’s disease (6). In addition, iTBS accompanied by exercise therapy has improved daily activities in disabled multiple sclerosis (MS) patients (7). Moreover, rTMS on the motor cortex has improved hand dexterity in MS patients with dysmetria (8), as well as bladder activity in MS patients with lower urinary tract dysfunction (9). Abnormalities in motor cortical excitability are accompanied by disability in MS patients (10). Furthermore, recovery after the relapse phase in relapsing-remitting (RR) MS patients is associated with increased motor cortex plasticity, which compensates for incomplete repair (11). Since there is no definite treatment for MS, and considering the effects of iTBS on cortical plasticity and motor function recovery, we hypothesized that iTBS over the contralateral PMC corresponding to the hand area could improve hand motor function and upper extremity motor imagery. This study was approved by the ethics committee of the Kerman University of Medical Sciences (permit number: 91/270/K), and conforms to the tenets of the declaration of Helsinki. All of the patients signed the informed consent for participation in the study. The sample size was chosen according to a formula related to the mean comparison of the two groups (12). The standard deviation was determined according to the study of Tabrizi et al. (13), and the type I error level (α) and test power (1-β) were 0.05 and 0.8, respectively. Therefore, we established a sample size of 18 patients in each group. From November of 2012 until June of 2013, 41 RR MS patients from the Kerman MS society in Iran were selected through convenience sampling. First, the diagnosis of RR MS was made by several expert neurologists based on the revised McDonald criteria (14). The neurologists determined each patient’s disability according to the Kurtzke Expanded Disability Status Scale (EDSS), with scores ranging from 0 to 10 (15). The mental status of the patients was also evaluated by means of a mini-mental state examination (MMSE), which has a maximum score of 30 (16). Handedness was assessed by the Edinburgh inventory (17). In order to compare the demographic characteristics of the two groups, the gender, age, educational level, and disease duration were recorded. Fatigue in the patients was evaluated using the Fatigue Severity Scale (FSS), ranging from 1 to 7, which had a high internal consistency (Cronbach’s alpha = 0.81) and stability over time (18). The depression score of the MS patients was measured using the Beck Depression Inventory-II (BDI-II), and its Persian version had high internal consistency (Cronbach’s alpha = 0.87) and acceptable test-retest reliability (r = 0.74). The maximum score of the BDI-II is 63 (19). The eligibility criteria for participation were: 20 - 40 year-old right-handed RR MS patients with MMSE scores > 24 and EDSS scores < 3.5. Those patients with recent relapses, pregnancy, addiction, other neurological diseases (stroke, seizure, etc. ), a history of head trauma, chronic psychiatric disorders, severe visual deficiency, or who had received corticosteroids during 12 weeks prior to the study were excluded. This study was a quasi-experimental study in which the patients were non-randomly assigned into two groups. Therefore, of the 36 RR MS patients, 19 received iTBS and 17 received a sham intervention (control group). Nine patients out of 19 in iTBS group were randomly assessed three days after the last intervention session. The intervention was carried out at the rTMS ward of the Zakaria neurological and psychiatric rehabilitation center of Kerman/Iran on MS patients. A trained graduate student who was not blinded to the type of intervention delivery to the patients performed the patients’ evaluations at the Kerman neuroscience research center. All of the patients were naive about the tests and blinded to the intervention. They were advised to continue their routine drug consumption. The MI ability and manual dexterity were assessed before and immediately after the last session of the intervention. The evaluation procedure began with the hand mental rotation task (HMRT), followed by the nine-hole peg test (9HPT), and ended with the box and block test (BBT). The MI can be measured by mental rotation in which the subjects judge the laterality of the human body presented in different orientations in the mental rotation task (20). In the present study, the hand MI ability was measured by the HMRT. At the beginning of each trial of the HMRT, a fixation cross was presented for 250 milliseconds (ms), followed by the presentation of a stimulus (rotated right or left hand) for 3000 ms, with inter-stimulus intervals of 1500 ms. The stimuli were drawings of both the back and palm views of the right and left hands, and these images were presented in six orientations (0°, 60°, 120°, 180°, 240°, and 300°). Each image was shown three times, and a total of 72 drawings were presented in random order. The patients were asked to decide whether the image was of the right or left hand, as quickly and accurately as possible, and responded by pressing arrow keys. In each orientation of the right or left hand, all of the data from both the back and palm views were pooled for analysis. Two variables were recorded via key pressing in the HMRT: reaction time (the time between the appearance of the stimulus on the monitor and the onset of the correct response in ms) and response accuracy rate (the proportion of correct responses in %). The maximum reaction time in this task was 4500 ms. In order to explore hand motor function, the 9HPT and BBT were utilized. The 9HPT is a component of the Multiple Sclerosis Functional Composite which has proven convergent and divergent construct validity. In the 9HPT, during four consecutive trials, each of the dominant and non-dominant hands was tested twice. Moreover, in each trial, the time needed to move nine pegs into nine holes on a pegboard, and then to return them to the container, was recorded (21). In the BBT, the number of blocks transferred from one part of the box to the other in one minute by the dominant and non-dominant hands was utilized to assess gross manual dexterity. The reliability and validity of the BBT have been confirmed (22). In this study, we delivered iTBS over the PMC. The magnetic stimulus protocol and stimulation intensity of iTBS was the same as in Huang’s study, while the magnetic stimulus had a biphasic waveform. The theta burst stimulation consisted of bursts of three pulses with 20 ms (50 Hz) intervals, repeated as a train of ten bursts with a repetition rate of 5 Hz (200 ms intervals) (4). A MagPro X100 magnetic stimulator (MagVenture, Farum, Denmark) connected to a Cool-B70 butterfly coil (MagVenture, Farum, Denmark) was used for the intervention, and both interventions were delivered for ten days over two consecutive weeks. Prior to the intervention, the motor hotspot and active motor threshold (AMT) were determined by single-pulse TMS during the voluntary contraction of the abductor pollicis brevis (APB) muscle. A single pulse was delivered over the left hemisphere corresponding to the hand area of the PMC, and an electromyogram was recorded from the contralateral APB muscle by a surface electrode in a belly-tendon montage. The coil was placed tangentially to the scalp surface, with the handle pointing posteriorly and rotated 45° away from the midline. The motor hotspot was defined as the location at which the lowest stimulus intensity was required to elicit motor evoked potentials (MEPs) from the APB muscle. The AMT was determined as the minimal stimulus intensity required to elicit MEPs greater than 200 μV in the contracting muscles in at least five of ten successive trials. The motor hotspot did not change during any session, and the AMT was measured each day before the intervention. The sham stimulation (control) with similar parameters to the real intervention utilized the lowest possible stimulation intensity (10% of the maximal stimulator output). The coil was angled away from the scalp so that it produced a noise similar to the real intervention, but no current was induced in the cortex and no contraction was seen (7). The results were reported as the mean ± standard deviation (SD) for the continuous variables, and the normality of the data distribution was assessed using the Shapiro-Wilk test. The demographic and clinical characteristics were compared between the two groups using an independent t test and Chi-squared test. The two experimental groups were compared in terms of the time needed to complete the 9HPT, the number of transferred blocks in the BBT, and the reaction time and response accuracy rate of the hand stimuli in the HMRT. These outcomes were measured before and immediately after the intervention, and three days after the last intervention session. All of the data were analyzed using the two-way repeated measures analysis of variance with the hand laterality (right and left) and time (pre and immediately post-intervention) as the within-subject factors, and the intervention (sham stimulation and iTBS) as the between-subject factor. Three levels of time (pre, immediately post, and three days post-intervention) were included as the within-subject factors in order to examine the effects of iTBS three days after the last session of the intervention in nine MS patients. We used SPSS (version 17.0; SPSS Inc., Chicago, IL, USA) for windows for the statistical analysis, and in all of the tests a significance level of 0.05 was used. 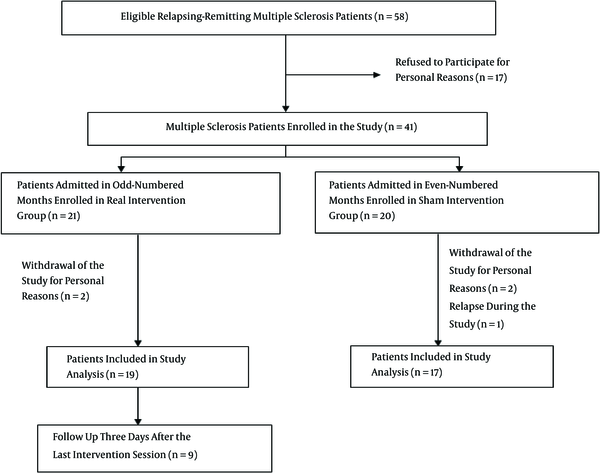 Of the 274 RR multiple sclerosis patients in Kerman city, 41 eligible patients entered the study (Figure 1). There were no significant differences in the gender, age, educational level, disease duration, FSS, BDI-II, or MMSE scores between the two groups of MS patients (Table 1). Moreover, no patient reported any adverse effects after either iTBS or sham stimulations. Abbreviations: MS, multiple sclerosis; iTBS, intermittent theta burst stimulation; FSS, fatigue severity scale; BDI-II, beck depression inventory-II; MMSE, mini-mental state examination. aValues are expressed as both the frequency and mean ± SD. Before the intervention, the time required to perform the 9HPT, the number of transferred blocks in the BBT by both hands, the reaction time, and the response accuracy rate of the right and left hand stimuli were not significantly different between the two intervention groups of the MS patients (Table 2). Abbreviations: MS, multiple sclerosis; iTBS, intermittent theta burst stimulation; RH, right hand; LH, left hand; 9HPT, nine-hole peg test; BBT, box and block test; HMRT, hand mental rotation Task; RT, reaction time; RAR, response accuracy rate. iTBS significantly improved the dexterity in both hands in the MS patients when compared to the sham stimulation, as detected by the reduction in the time required to complete the 9HPT, and the increased number of blocks transferred in the BBT in one minute (Table 2). However, the delivery of iTBS to the PMC did not influence the reaction time and response accuracy rate to the right and left hand stimuli of the HMRT compared to the sham stimulation in the MS patients (Table 2). The improvement from the effects of iTBS on the hand motor function remained three days after the last session of the intervention. The time required to perform the 9HPT and the number of transferred blocks in one minute in the BBT differed significantly immediately after the intervention, as well as three days after the last session of the intervention, when compared to before iTBS delivery in nine MS patients (Table 3). Abbreviations: MS, multiple sclerosis; iTBS: intermittent theta burst stimulation; 9HPT, nine-hole peg test; BBT, box and block test; Session 1, before the intervention; Session 2, immediately after the last session of the intervention; Session 3, three days after the last session of the intervention. For the first time, we explored the effects of ten days of iTBS over the PMC on the hand motor function and upper extremity MI ability in MS patients. We used an iTBS protocol for treatment because, despite its short duration and low intensity of stimulation, it induces a long-lasting effect on the motor cortex (4). Our findings suggested that performing iTBS over the PMC in the MS patients for ten days over two consecutive weeks was safe and convenient, without inducing seizures or other side effects. The findings of the current study showed that performing iTBS over the left PMC enhanced the dexterity in both hands. This positive impact continued for three days after the last session of iTBS. Since the previous findings revealed that in the right-handed subjects the MI and motor function of both hands were lateralized to the left hemisphere of the motor cortex (23, 24), the positive effects of iTBS over the left hemisphere on the left hand motor function were observed as expected in the present study. Our findings involving increased manual dexterity via iTBS were consistent with previous studies which showed that iTBS over the motor cortex improved motor dysfunction in chronic stroke patients (5), and also improved the daily activities and health-related quality of life in MS patients (7). A similar study of eight RR MS patients with cerebellar impairment indicated that the rTMS over the arm area of the PMC temporarily improved hand dexterity after a single session (8). Another study on ten MS patients with lower urinary tract dysfunction showed that the delivery of a 5 Hz rTMS to the leg motor cortex improved bladder activity by enhancing the corticospinal tract excitability (9). There are several possible mechanisms for the therapeutic effects of rTMS. For example, the cortical magnetic stimulation induced long term potentiation-like effects at the synapses in the neuronal circuitry of the motor cortex via the glutamatergic neuron (25) or GABAB autoreceptor activation (26). This type of stimulation elevated the expression of the brain-derived neurotrophic factor (27), nerve growth factor (28), and neuromodulators such as cholecystokinin (27), which influence synaptic plasticity and neuron survival. iTBS can enhance the cortical synaptic plasticity (4) and increased synaptic plasticity as a compensatory mechanism for the incomplete remyelination (11). Contrary to our hypothesis, iTBS over the PMC did not improve the reaction time and response accuracy rate of the HMRT when compared to the sham stimulation (control). After the intervention in both groups, the reaction time declined and the response accuracy rate was enhanced, likely because of a learning effect. There are several possible explanations for the failure of iTBS over the PMC to affect the reaction time and response accuracy rate of the HMRT as indices of the MI ability. The activation of multiple areas of the cortical network, such as the PMC, premotor cortex, pre-supplementary motor area, superior and inferior parietal lobes, primary visual cortex, and cerebellum, during MI has been shown (29); therefore, the PMC stimulation alone in the current study did not have sufficient influence to improve the HMR ability. Another possibility is that iTBS induced PMC excitability through a unique series of synapses not involved in the HMRT. Similar to this finding, previous studies have revealed that iTBS over the PMC in healthy subjects increased cortical excitability, but did not improve motor learning and retention when compared to the sham stimulation (30). There were some limitations to our study; for example, we could not recruit a greater number of eligible RR MS patients. In addition, those RR MS patients with severe motor dysfunction and cognitive impairment were excluded from our study. In this study we did not follow up the effects of iTBS over a long period of time in the MS patients. Moreover, the plasticity parameters before and after the intervention were not investigated. In summary, we have demonstrated that iTBS over the left PMC had a positive impact on manual dexterity, but did not influence the upper extremity MI ability. The authors would like to thank the MS patients who participated in this study, as well as the staff of the MS society of Kerman. This study was supported by funds from the Kerman neuroscience research center in Kerman/Iran (Grant number: KNRC/91-21). Authors’ Contribution: Nasser Zangiabadi was responsible for supervision in all stages of the study. Nasser Zangiabadi, Mahdieh Azin, and Seyedshahab Banihashem contributed to the study design. Farhad Iranmanesh participated in the recruitment and examination of the multiple sclerosis patients. Seyedshahab Banihashem participated in the delivery of the intervention. Farhad Iranmanesh and Mahdieh Azin participated in the acquisition of the data. Mohammad Reza Baneshi and Mahdieh Azin contributed to the analysis and interpretation of the data. Mahdieh Azin and Farhad Iranmanesh participated in drafting the preliminary manuscript. Nasser Zangiabadi, Farhad Iranmanesh, Mohammad Reza Baneshi, and Seyedshahab Banihashem contributed to the manuscript revision.